My little guy, Alex, turned 4 in May. 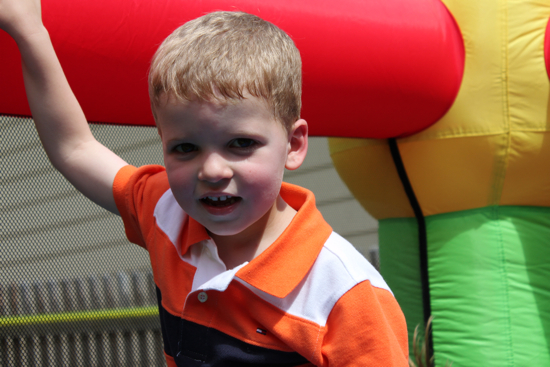 We celebrated with yet another backyard birthday party. This year we went with a construction themed party. After the cowboy and cars themed parties the last two years, Alex really gets into choosing his theme. Fortunately, I was able to direct him towards a construction theme that my neighbor Meghan (yes, THAT Meghan) also used for her son's birthday a few years ago. She is so awesome that she saved the signs she made and even moved them to her new house (yes, still in the neighborhood!). 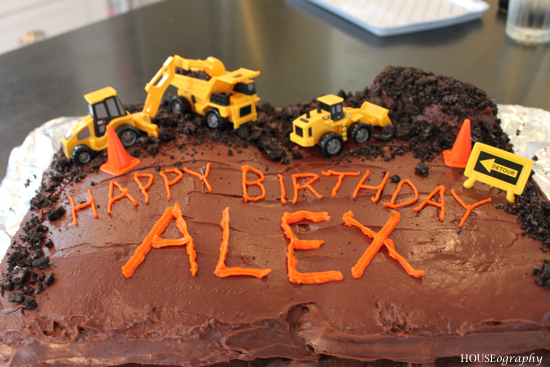 She did a lot more for her son's party but I think my party still passed muster with Alex! The cake was a masterpiece if I do say so myself. Jim baked two chocolate cakes in 13x9 pans. We then laid them on a foil covered cutting board and layered on the chocolate icing with the aim of not being careful about it. I created a little hill on the right side using two leftover cupcakes, and added some smashed Oreos. Finally, I used some of Alex's construction toys for construction site effect. Fun! In other food news, I made a few signs for the food items. 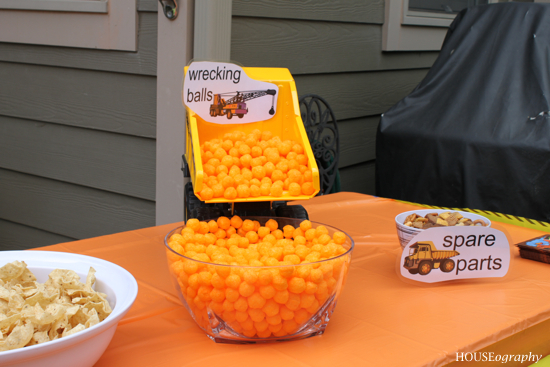 Cheeseballs were a HUGE hit with kids and adults. Chex mix served as 'spare parts'. 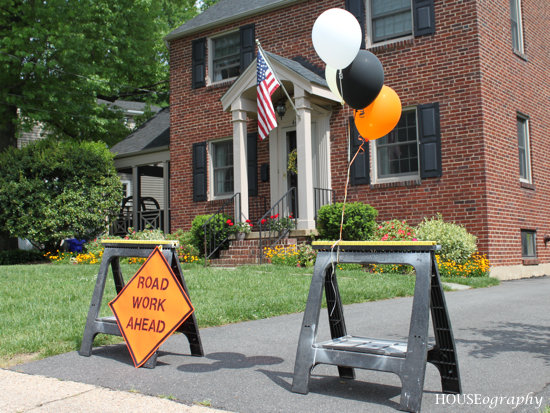 When guests entered the party, they passed through the roadwork signs (made by Meghan) and one of our sets of sawhorses. 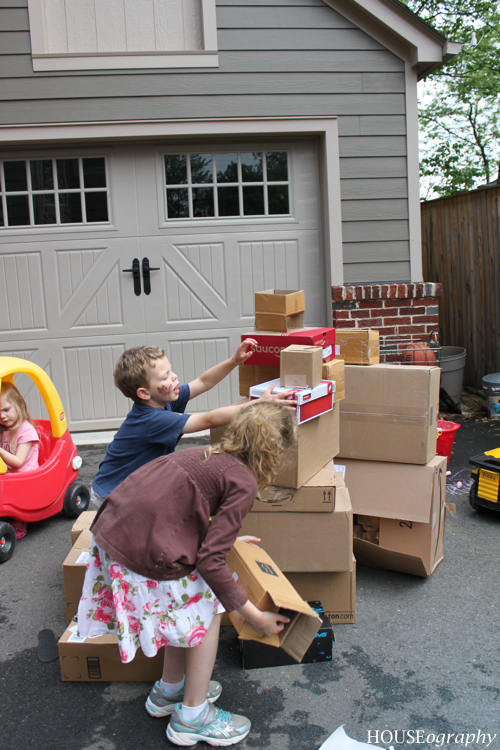 In the back of the driveway, I had a big stack of boxes available for stacking and building. I had visions of having painted all of these boxes but that just did not happen. This was free and easy, and really fun to play with! 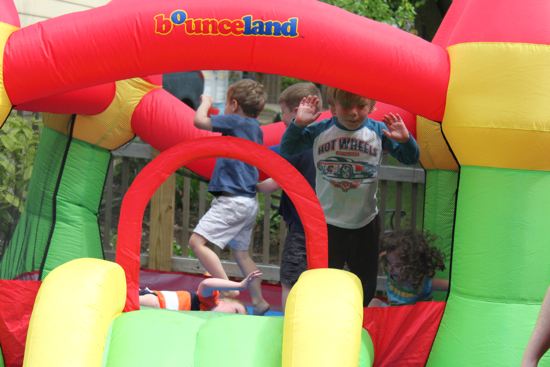 The kids spent most of their time in our moon bounce. This was a great investment and we have more than gotten our money back. We'll break it out again for our 4th of July neighborhood party this weekend. 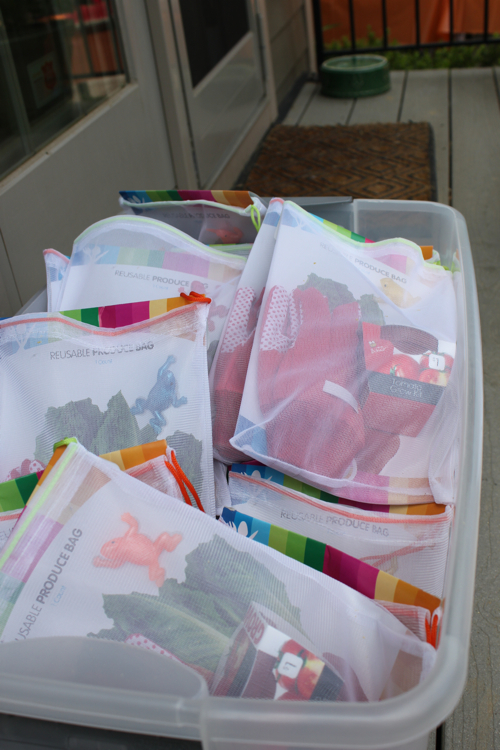 Each child received a gift bag that included a pair of kid size gardening gloves, a small tomato or strawberry plant kit, a small sticky frog (one of my kids' favorite toys!! ), all packaged in a reusable produce bag. All of these items were found on the Target dollar spot except the sticky frogs from the party section. 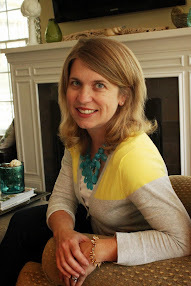 I decided not to get any entertainment or other activity because I find that my kids mostly just want to play. Might have to change things up for his 5th birthday and get some sort of entertainment or activity. It was a fun afternoon with family and friends.